**SET IN APPROXIMATELY 2.5 ACRES OF LAND** is this superb imposing stone built eight bedroom period farmhouse including two annexes, one of which is fully contained and part of the building is believed to date back to the Domesday book. There are a total of four bathrooms and additional separate WC. To the main farmhouse the accommodation comprises five bedrooms, two bathrooms, stunning lounge with log burning stove, dining kitchen/family room, conservatory and utility room. 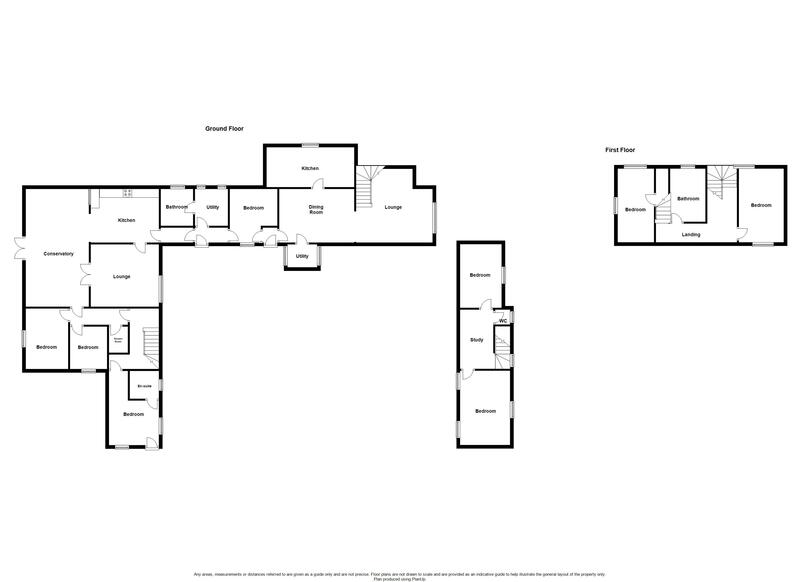 Annexe 1 comprises a porch/utility room, dining area, kitchen, lounge, two double bedrooms and bathroom. Annexe 2 has an open plan bedroom/living space and en-suite shower room. The property also benefits from uPVC double glazing and gas central heating, extensive off road parking for a multitude of vehicles. The property is located within the semi-rural hamlet of Woodall with excellent links to the motorway network. Sheffield and Rotherham are within easy travelling distance. A uPVC door opens into the front porch with solid hardwood door giving access to the hallway. With ceramic tiling to the floor, wood panelling to the walls and central heating radiator. Inbuilt storage cupboard. Range of solid oak wall, drawer and base cabinets, complementing work surfaces incorporating a black porcelain sink and drainer with mixer fitting. There is space for Range style cooker, plumbing for dishwasher and space for large American style fridge freezer. There is ceramic tiling to the spalshbacks and floor, central heating radiator with decorative cover. Central island with stool space beneath. Providing spacious versatile living space having solid oak flooring and French uPVC double glazed doors leading onto the rear garden. Having wood panelling to half height, solid oak flooring, side facing uPVC double glazed window and French doors into the conservatory. The focal point of the room is the stunning Inglenook fireplace inset with multi fuel log burning stove. With plumbing for automatic washing machine and space for tumble drier. Ceramic tiling to the floor, counter top inset with sink. Comprising white suite with free-standing roll topped bath, wash hand basin inset into vanity cabinet with marble counter top and storage beneath. Low flush WC, uPVC double glazed window, contemporary column radiator and ceramic tiling to the floor. The double bedroom has a double aspect with front and rear uPVC double glazed windows, central heating radiator and laminate flooring. Ample space for free-standing wardrobes and additional bedroom furniture. With laminate flooring and stairs rising to the first floor landing. The double bedroom has a side facing uPVC double glazed window, central heating radiator and laminate flooring. Once again having ample space for free-standing bedroom furniture. With a rear facing uPVC double glazed window, central heating radiator and laminate flooring. Space for free-standing bedroom furniture. With walk-in fully tiled shower cubicle, white wash hand basin inset into vanity cabinet and low flush WC. Column central heating radiator and black granite tiling to the floor. Inset spotlights to the ceiling, inbuilt storage cupboard and extractor fan. With velux skylight, central heating radiator and window to the staircase. This space is ideal for an office/home study area. Having two rear velux skylights and front facing dormer window, central heating radiator and fitted carpet to the floor. Substantial range of inbuilt wardrobes, space for further free-standing bedroom furniture. With low flush WC and ceramic tiling to all walls and floor. With a dormer window, inbuilt storage cupboard, central heating radiator and laminate flooring. Space for free-standing bedroom furniture. Walk-in wardrobe with power and light. With uPVC double glazed rear and side windows, oak flooring and central heating radiator. Inbuilt cupboard housing the central heating boiler,. Feature fireplace with electric fire. With a fully enclosed shower cubicle, wash hand basin inset into vanity cabinet, low flush WC, extractor fan, side opaque window and ladder radiator. Laminate covering to the floor. A timber door opens into the front porch/utility with further door into the dining area. With oak flooring, central heating radiator and space for dining table and chairs. Range of wall and base cabinets, contrasting work surfaces and ceramic tiling to the floor. Plumbing for automatic washing machine and space for cooker and fridge freezer. Sink and drainer with mixer fitting. The double bedroom has a double aspect with front and rear uPVC double glazed windows, central heating radiator and fitted carpet to the floor. Inbuilt wardrobes and ample space for further free-standing furniture. The double bedroom once again has a double aspect with front and rear uPVC double glazed windows, central heating radiator, fitted wardrobes and spotlights to the ceiling. Having a white suite comprising bath, separate enclosed double shower cubicle, pedestal wash hand basin, bidet and low flush WC. Dormer window, vinyl covering to the floor, central heating radiator and ceramic tiling to the walls. Recessed spotlights to the ceiling and inbuilt storage cupboard. The property resides in approximately 2.5 acres of land, gardens and parking. A driveway to the front of the property with turning area provides extensive parking for a number of vehicles including farm vehicles, vans, caravan etc. Access to the two fields is via double gates to the parking area. The rear gardens are well maintained and a recently laid stone patio provides space for outside dining and additional seating. Also having external power supply, security lighting and cold water supply.